The hosts for the tournament will be the Federation of Sports Bowling Russia, whose President, Alexander Gogolev, said: "We are very pleased and proud to have been chosen to be QubicaAMF's partner for the 2007 Bowling World Cup and we are looking forward to welcoming players from all over the world to St. Petersburg." The tournament, which will take place between November 3rd and 11th, will be held in the 32-lane state-of-the-art "Continent" bowling center located in one of the biggest newly built shopping malls of St.Petersburg. The bowling centre main shareholder/partner Vladimir Markin and Managing partner Igor Shubert were also overjoyed to be involved in this most prestigious event and said: "This is the first time that the QubicaAMF Bowling World Cup will come to Russia and we are sure that the players, coaches, officials and supporters will be impressed with our centre and our city." St. Petersburg lies on the river Neva and was founded in 1703 by Tsar Peter the Great as his 'Window to the West'. It was the capital of the Russian Empire for 200 years and has also been known as Petrograd and Leningrad. It is Europe’s eighth largest city and a major cultural centre, and is a UNESCO World Heritage Site. World Cup visitors will be treated to dazzling palaces including the baroque Winter Palace, which now houses the Hermitage museum with its important collection of art, not to mention Faberge jewellery and the Russian imperial regalia. 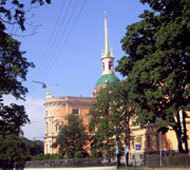 The city also boasts many churches, including the huge St. Isaac's Cathedral. The QubicaAMF Bowling World Cup is the world's largest annual sports event in terms of number of nations competing. It was first held in Dublin, Ireland, in 1965. Last year's event was held in Caracas, Venezuela, where the winners were Osku Palermaa (Finland) for the men and Diandra Asbaty (USA) for the women. QubicaAMF Worldwide is the founder, organiser and principal sponsor of the Bowling World Cup. Additional information on the QubicaAMF Bowling World Cup, including archives and bulletins for this year's tournament, can be found on www.qubicaamf.com.